Sure, everyone knows that an apple is a better snack than potato chips, but do you know that a daily handful of walnuts or a bowl of blueberries can actually improve your well-being and longevity? Steven Pratt, M.D., witnessed the positive results that occurred when his patients changed their diets to include certain powerhouse foods -- those he has identified as SuperFoods. Backed by proven research on fourteen of the most nutrient-dense foods, this book puts these tools in your hands, and on your plate, to give you more energy, greater protection against disease, and a healthy lifestyle now and for the future. This book should be mandatory reading for every American. You shouldn't be able to graduate high school without reading it. Hell, health insurance companies should send you a free copy when you enroll in a new plan! Anyway, old habits die hard. My version of avoiding allergenic foods was to get the chicken nuggets at McD's instead of the quarter-pounder with cheese, which does remove the wheat, eggs and dairy, but then there's still a nice fat helping of oil and other nasty elements in those foods. I was limping along trying to change my diet. Try reading labels on processed foods in your average supermarket and see how hard it is find one without wheat or dairy. It's nigh well impossible. You'd be astonished how many places refined flour is hiding: vegetarian soups, oat-based cereals and every TV dinner ever made. Then, one day, while at the local Borders, shopping for my dad for Christmas, I spotted Superfoods Rx. I guess I picked it up for two reasons: (1) I'd been hearing about "superfoods" in the media and figured I should try to understand them, and (2) the cover. That beautiful cover is so tantalizing and delicious I practically wanted to eat it! Many props to the food designer or the cover designer or the photographer or whoever put together that cornucopia of lovely food. Little did I know then, though, that picking up a book with pretty cover could improve my life so much! After "digesting" Superfoods (hee), I've learned to love good food for the first time in my life. I have learned how to truly nourish myself--and genuinely gratify myself with food in a way that's simply impossible with Hostess Cupcakes and their ilk! My cooking skills are picking up quickly, and I never go out for expensive lunches at work anymore, because I've always got my homemade boxes of spinach salad with avocado and grapefruit, bean-lentil-onions-and-tomato soup, or a healthy serving of salmon sashimi from the local Japanese market. I now keep a list of all the superfoods (from this book and the "sequel" Superfoods HealthStyle) on my fridge. And I buy as much fruit as I can carry home and/or afford from the nearby produce market that I now patronize weekly. Superfoods is one of the best-written, smartest, most understandable, realistic and potentially transformative books written in the food and health category in a very long time. Get it today. This is a super book for people wanting to make good food choicies. What set this book apart is that the various foods listed are accompanied by what diseases and conditions they help to prevent or combat. And, suprisingly, none of the foods are exotic foods! I loved the simple and enthusiastic style of the author, especially as he compares (in the introduction) the hypothetical 68-year-old who is on pharmaceuticals with the 68-year-old that is still physically active because he ate right. Dr. Pratt somehow chose the top 14 superfoods, based on all kinds of studies which he cites. Though I have researched nutrition a lot, I learned plenty of gems and pearls from this book, such as the value of eating (organic) orange peels for the limonene, the importance of eating the orange pulp (high in Vitamin C), rolling a citrus fruit before juicing to get more of the juice out, low calorie ways to get high amounts of nutrients (ex: pumpkins), squeezing a teabag to get much more of the flavonoids released, and that spinach is an unequaled superfood. I gave only four stars because a few of the foods he recommends have a strong downside. For example, while yogurt is the least indigestible of all dairy, most people simply can't handle dairy and (as proven in The China Study) the casein protein actually increases the odds of cancer. Also grains--whether whole or not--are not the easiest of foods to digest. He also lists "fluoride" on the ingredients of tea as if that were a good thing, whereas it has been proven toxic (read The Fluoride Deception, which is packed with research) and it is unfortunate that the tea plant (which in itself is a great superfood) absorbs this toxin from the environment. Even soy, unless eaten sparingly, can present health problems due to the excess of phytoestrogens. And Dr. Pratt suggests on several pages that we microwave food, though microwaving has been proven to create toxins in food. Eating microwaved food was found to cause abnormal changes in human blood and immunity in a study done by Dr. Hertel of Switzerland, and microwave ovens were even banned in Russia. This is an excellent book to help learn more about making beneficial food choices as part of a healthy lifestyle. It is not a fad diet or gimmick to lose weight fast. In addition to the 14 suggested "Super Foods," the author identifies "sidekicks" for each, which offer similar benefits. The author also provides recipes, offering guidance on how to prepare these foods using healthy cooking choices, too. (I've already tried a few and they're fabulous!) Finally, throughout the entire book the author supports his information with research-based evidence, with references, from peer-reviewed journals. Although the focus is not on losing weight, when you take the advice of the author and begin to eat all of the foods necessary for a long, healthy life, you have little room left to eat the garbage that keeps on the extra pounds! My husband lost 60 lbs following the Sugar Busters diet several years ago, but since then we have not followed any one particular "diet", per se. Instead, we try to eat lots of fruits and veggies, moderate amounts of meat, and just eat healthy in general... still working on the exercise aspect! This book offers a lot of good information, and not only is it practical advice for a healthy lifestyle, but it is also just plain interesting to read~at least, it is to me. The SuperFoods named are easy to find in the supermarket, and are easy to incorporate into an every day diet. Someone mentioned that it was ludicrous to expect that eating any particular food(s) would change your life. Perhaps. But it is also ludicrous to expect that we will continue to have a healthy body with the way that so many people (especially children) eat these days. The fact that good food and excellent nutrition habits lead to better health should come as a surprise to no one. This book serves as a guidemap to help those who are "lost", and even some who aren't... find their way back to good health and a healthy lifestyle. What I like most about this book is that it stresses healthful eating and not dieting. It's a book for everyone. Folks, listen up: there are plenty of skinny people out there who are unhealthy (I knew someone who lived on a diet consisting of diet coke, candy bars and cigarettes and had quite a trim figure but who ended up with a bunch of other health problems that weren't visible on the outside to the layman's eye). This book gets into the best foods for the human machine - for what ails you or for what you can prevent from ailing you in the future. I read it because I was feeling tired and looking pale and I wasn't keen on choking down a fistful of supplements every day. The 14 foods are actually quite good - oranges, pumpkin (I always was partial to orange food), broccoli, turkey, nuts, oats, wild Alaskan salmon etc... The recipes are really good too - not like other books that substitute artificial ingredients for calories' sake (there's no splenda here thank heavens). You use real sugar (but a lot less of it and most of the time brown sugar), real flour (regular and whole wheat), real eggs... well you get the idea. I made the oat bran muffins that were sweetened by grinding an orange in the blender combined with a little brown sugar and I couldn't believe how good they were. I also made the apple crisp which was very good (made with walnuts) and am planning to try the pumpkin pudding and the salmon burgers next. The other excellent thing is that the book gives shopping lists of the really good brands/products and all are items that anyone can purchase in a regular supermarket or Trader Joe's (except the eggs - I couldn't find the eggs he suggests so I just bought organic). This is about making better choices and living healthier and if you approach it that way, you will automatically be healthier and feel better. I felt better after only the first few days. I have more energy already and my skin looks really nice too. Oh, and I hear the sequel includes dark chocolate (my favorite) and red wine (my favorite). Something to look forward to after I eat my way through this one. If you are trying to eat in a more healthy way this book is a must. This book discusses each of 14 foods that in one way or another help prevent heart disease, cancer and other health problems. A discussion of each food and its healt benefits is written in a way that anyone can understand. Information about what to look for when shopping for foods as well as menus and recipies make this book a must. Simple, intelligent, proven and invaluable. Pratt is not advocating faddy diets, speedy weight loss nor any other such eating plan you will stray away from in days because it's dull, uninspired and useless. Quite the contrary, he supplies you with clinically researched evidence that indicates how and why these super foods are good and why you should get more of them in your diet. None of them are difficult to introduce into your diet in great quantity and none of them are insipid, tasteless nor a chore. The other outstanding benefit is that it works! You WILL notice an energy increase and a general improvement in day to day functioning. This is how all self help books should be designed and published, with sound clinical research and evidence at it's foundation and the desire to improve health at it's core. 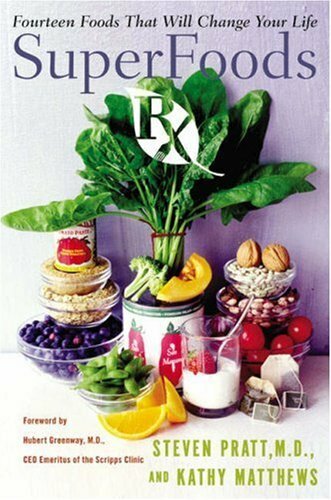 Superfoods RX provides a good summary of some of the best foods to eat in a healthy balanced diet. One of the best things about this book is that the foods listed also come with sidekicks. Most of the foods are not only nutritious, but delicious as well. All of a sudden, something like a turkey sandwich with spinach leaves, tomatoes, and made with oat bread is a superfood buffet. Another delectable delight, vanilla yogurt with fresh blueberries, walnuts, and oats is an ideal, filling and tastey breakfast. The inclusion of pumpkin is a little problematic for me because I have mostly ingested pumpkin in pastries and in pies. Winter squash will probably do in meeting the pumpkin requirement though I'll take the challenge to find more creative uses for pumpkin. (Anyone have a good pumpkin soup recipe to share?) The inclusion of soybeans and beans is a little duplicative though I have to admit that nothing goes with beer as well as edadame. Except in high sodium Chinese soups, I don't do tofu so I might have to find other ways for using edadame if I'm going to follow the book's soy recommendation. The authors by including tea as a superfood makes my former Mormon self chuckle a bit. Evil tea listed as a health food? Joe I guess you messed up on that one. As for salmon, it's a good news bad news situation. I love salmon, but try finding affordable wild salmon in Utah. The farmed, color added stuff just doesn't cut it health-wise or taste wise. I have made salmon salads from canned Alaskan salmon on a bed of spinach leaves, mixed with tomatoes, broccoli, walnuts, and orange slices. It was actually quite tastey. I might have to take a trip to Alaska every summer to meet the Superfoods recommendation, but I'll give it a go. All in all, I found this book a pretty good nutritional guide. The only thing better would have been if he added a good cold lager as a superfood. That's all your diet needs really. Just read the book, and then start introducing these Superfoods into your diet one at a time. You don't need to give anything else up (though over time, you may find yourself giving up a few things willingly), as this change should be gentle and gradual. I haven't given up pizza or chocolate chip waffles (yikes! ), but I have made berries, soymilk, salmon and spinach a part of my regular diet. This is a HUGE improvement compared to what I was eating a few years ago. I'm not eating ALL of the Superfoods with regularity yet, but I'm working on it. *Decreased energy expenditure; people just don't exercise enough. *Unhealthy balance of fats in the diet:an increase in saturated fat, omega-6 fatty acids, and trans-fatty acids, along with a huge decrease in omega-3 fatty acids. *An increase in consumption of processed cereal grains. *An overall decrease in fruit and vegetable intake from historical standards. *A decrease in lean meat and fish intake. *A decrease in antioxidant intake and calcium intake (especially from whole foods). *The unhealthy ratio of omega-6 to omega-3 fats,which is associated with a long list of chronic diseases. *A marked increase in refined sugar as an overall percentage of caloric intake. *A decrease in whole food consumption, which has led to a marked decrease in phytonutrient intake. *A decrease in the variety of foods eaten. SuperFoods is a great leap in the right direction for anyone looking to improve his or her diet. Positives: the format and suggestions are some of the best in the diet class. It's easy to follow, the suggestions are not too expensive, and the book includes a great deal of scientific explanations and references. Negatives: the author suggests consuming beans, oats, soy, and dairy. These foods are generally beneficial for one's health, however after reading The Paleo Diet: Lose Weight and Get Healthy by Eating the Food You Were Designed to Eat by Dr. Cordain, I learned that human bodies are not properly engineered to consume such foods. I have to tell you that once I began this read I could not put it down. The information that is packed inside of it to help us promote better health is superior to most that I have read. Dr. Pratt gives us fourteen foods that will definitely bring us closer to a healthy body if we will incorporate them in our diet. These are: Beans, Blueberries, Broccoli, Oats, Oranges, Pumpkin, Salmon, Soy, Spinach, Tea, Tomatoes, Turkey, Walnuts and Yogurt. Not all on your 'favorite list;? take heart, the good doctor also provides some alternatives in each group for you to chose from. He dedicates an entire chapter to each one, clearly defining their benefits for our bodies. He winds down this outstanding educational read by giving us some wonderful recipes and some important nutrition facts and slam dunks it with a chapter titled, SuperFoods RX Shopping Lists, that will allow you to take the guess work out of which product has what , and which is the best to buy (something I always have trouble figuring out); and for those hard to find items, he includes their email or street address. This really is a useful, informative book; especially for those who wish to improve their health by adding foods that are readily available. Dr. Pratt does an outstanding job, writing in a clear and concise manner, bringing to light just the right amount of information you need to know without boring you. This book is a keeper, and one you will turn to time and time again. Recommended. The suggestions in this book have really stuck with me for a couple of years now. I've always noticed that spinach and tomato juice, gave me an extra surge of energy, that I always had a sense of wellbeing after eating oatmeal, got a kick out of brocolli, never had a bad thing to say about beans, felt fortified after having my yogurt. The book made me think that I should be paying attention to those feelings and capitalize on them. Put some of each into my shopping basket each time I go to the store and eat them instead of junk when I'm hungry. I was raised on hot dogs, cola, and candy. This book was a real eye-opener! The authors make a coherent case for the 14 "Superfoods". Some are fairly common (like tea), others obvious (broccoli, spinach). I was surprised by the inclusion of pumpkin (and its substitute the sweet potato). I have been reading nutrition books for over a decade. This book relates back to studies that are proven. It really boils down what the best foods are and why. The book recommends how to cook and eat these foods. About 2 years ago, I read a book called "The Abs Diet" that really gave me an education in nutrition and health. Or so I thought. I managed to lose quite a bit of weight by adapting my lifestyle to be more like the abs diet (e.g. eat their 12 powerfoods, eat six times a day rather than three, etc. ), and it worked out very well. I did have a few unanswered questions about nutrition, however, and it was always my understanding that it could basically come down to the number of grams of fat, protein, and carbs you ate, and as long as you had a multivitamin or two a day, you'd be going by a nutritionally sound lifestyle. The thing that SuperFoods did for me was to come out and basically make these few points that there are things beyond macronutrients (fat, protein, carbs) and micronutrients (vitamins, minerals): they are called phytonutrients and are not all very well understood -- but if you've heard of things called beta-carotene, antioxidants, and other random things, thats what these are, and they are generally what make superfoods super. At a first glance, I wondered how this book could be anything beyond listing the superfoods themselves, but after reading the book, I did think there was value in it. Even though I don't/won't remember a lot of the facts that the author threw out there, I know that having read them I'm pretty sure that I'll be eating broccoli every day from now on! By the way, a lot of this book is really just confirming what I've been told from other sources, but for some reason it just makes the point stick a lot harder. 7 years ago I moved to San Diego and was a ophhtalmic technician for Steve in his La Jolla practice. He was always stressing nutrition to his patients and to us. It felt like mom trying to get you to eat your veggies. In 1999 I was an overweight single mother overwhelmed by life and never really considered the direct correlation of what kind of energy-if any-that I was or was not getting from the junk that I ate. I remembered Steve telling a patient who wasn't thrilled with the foods on some of the liturature that we frequently distributed to our patients, he told her "if you can just commit yourself to 6 months of eating really healthy I promise it will never be tough for you to do it for life and you will feel so much better". I thought it was just another "trick" to get her to eat right. Low and behold there is something to all this super food stuff! Years after leaving his practice and getting fatter and fatter I finally decided it certainly couldn't kill me to commit 6 months to it. Five years after working with him or even seeing him those words still rang in my head. This book wasn't out yet but I was armed with tons of his litrature abd ready to commit myself. I went from about 240 pounds to 130 and have maintained it for two and a half years with little or NO effort. I feel fantastic, I have energy for the first time in my life, I am totally staisfied when I eat and have since learned to be quite a cook. I am actually far more obsessed with food than I ever was, but now I am obsessed with how I can use it to make myself and my family healthier. I get almost giddy everyday thinking "what can I make today!?" as silly as that sounds, it is true. This changed my eating habits.